Sayyidi Abd’Al Aziz Al-Dabbagh (rehmatullahi ta ala alayh) presented as proof-God be pleased with him-for the general existence of affliction in Paradise. And al-Bayhaqi and Ibn Abi’l-Dunya published from Aisha-God be pleased with her-that she reported: “The Apostle of God-God’s blessings and peace be upon him-said: ‘If there’s any moment spent by a human being in which he doesn’t recollect God favorably, he’ll be afflicted for it on the Day of Resurrection.””This is what the Hafiz al-Suyuti cites in the above-mentioned chapter. Verily, Allah and his angles bless the Prophet! O you, who believe, ask (Allah) to bless him and grant him abundant peace! I am here, Ya Allah, at Your service and at Your Command, my Lord! The blessing of Allah (subhaanahu wa ta’ala), the good, the Merciful, and of his closest angles, and of the Prophets and of the sincere ones, and of the martyrs and of the good ones and of whatever else exists which glorifies You (Ya Allah), O Lord of the worlds, are for our master Muhammad (Sollallahu ‘Alaihi Wasallam), son of Abdullah (Radhi allah ta’ala anhu), the seal of the Prophets and the master of Messenger The Leader of the Pious and the Messenger of the Lord of the world, the witness the Bringer of Good Tidings, the caller to You (Ya Alalh) by Your leave, the Lamp, the Illumined one, on him may there be peace! Ya Allah grant Your blessings and Favours and Your Mercy to the master of the Messengers and the Leader of the pious and Seal of the Prophets, our master Muhammad (Sollallahu ‘Alaihi Wasallam), Your slave and Your Messenger, the Pioneer of Goodness and Guide to the Goodness, the Messenger of Mercy! 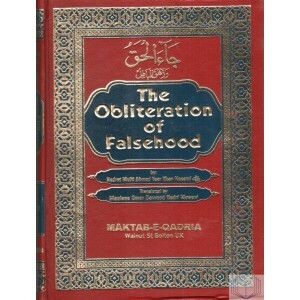 Through the grace of Allahعزوجل , I (Mufti Ahmad Yar Khan Na’eemi) rehmatullahu alaih have Comprehensively written about the issue of Taqleed in the beginning of this book Ja Al-Haq (The Obliteration of Falsehood), which has remained unanswered by Wahabi Ghair-Muqallids even until today. In continuing with this topic, we briefly explain the need and benefits of Taqleed as well as the harms and ills of not following it. The Sahaaba were the Imams of the entire world. Which Imam would they follow?! A CONVERSATION between Hazrat Mohammad(Salla Allahu ta’ala ‘alayhi wa Salam) and a traveler. A traveler once came to the mosque to see the Prophet Mohammad (Salla Allahu ta’ala ‘alayhi wa Salam). After greeting the Prophet he was asked where he was from. The traveler replied that he came from very far just to get a few questions answered. Following is the dialogue between the traveler and the Prophet. Traveler : I do not want aazab to be written in my account. Traveler : I want to be known amongst people as an intelligent person. Prophet : Fear Allah always. Traveler : I want to be counted amongst Allah’s favorites. Prophet : Recite Quran every morning and evening. Traveler : I never want to be away from Allah’s blessing. Prophet : Always treat fellow creatures well. Traveler : I never want to be harmed by my enemies. Prophet : Always have faith in only Allah. Traveler : I never want to be humiliated. Prophet : Be careful of your actions. Traveler : I wish to live long. Traveler : I want my sustenance to increase. Prophet : Always be in Wudhoo. Traveler : I wish to stay free of aazab in the grave. Prophet : Always wear pure (Paak) clothes. Traveler : I never want to burn in hell. Prophet : Control your eyes and tongue. Traveler : How do I get my sins forgiven. Prophet : Always ask forgiveness from Allah with a lot of humility. Traveler : I want people to respect me always. Prophet : Never extend your hands of need at people. Traveler : I want to always be honored. Prophet : Never humiliate or put down anyone. Prophet : Recite sura e mulk often. Traveler : I want my wealth to increase. Prophet : Recite Sura E Waqia every night. Traveler : I want to be safe and at peace on day of judgement. Prophet : Do Zikr of Allah from dusk to night. Traveler : I want to be in full attention and concentration during namaaz. Prophet : Always do Wudhoo with concentration and attention.